Thank you for signing up to get updates. 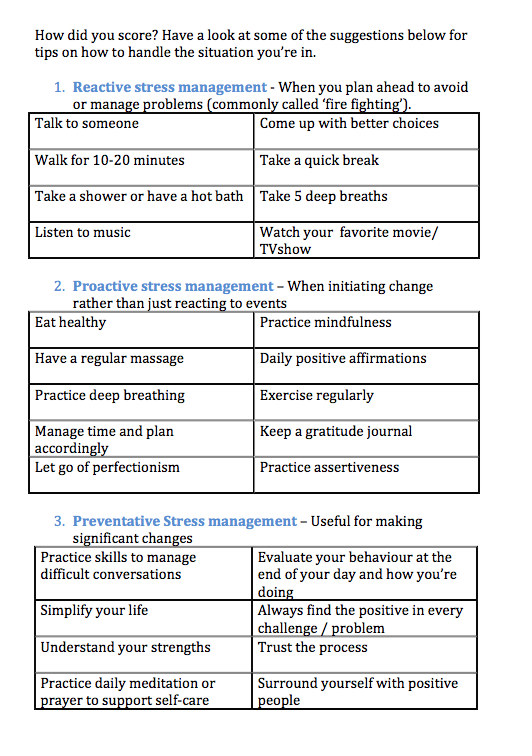 This is your stress symptoms checklist below. The definition of stress reads: a specific response by the body to a stimulus, as fear or pain, that disturbs or interferes with the normal physiological equilibrium of an organism (psychology) or a load, force, or system of forces producing a strain. Stress is basically our perception of a load that has been placed upon us, which is why everybody handles stress differently. What stresses one person is handled brilliantly by another. Change, for example, is hard for some people and becomes stressful for that person, while another person thrives on the challenge of the same change. However, there is positive stress as well. Positive psychological stress can lead to motivation and challenge instead of anxiety. The effects of experiencing eustress, which is positive stress, versus distress which is negative stress, are significant. Distress causes a slowing of working pace, while eustress can lead to focus and flow (Wikipedia). Below are the symptoms of stress broken down into four categories. 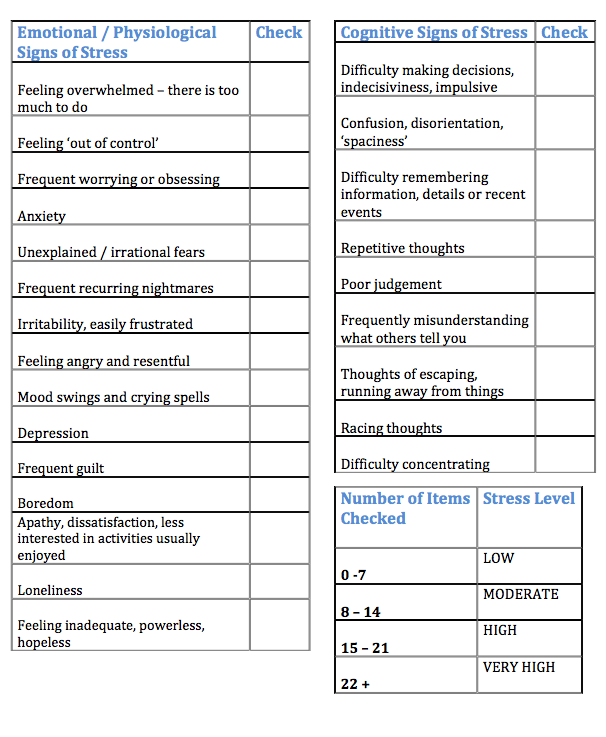 Use the list below to check off the symptoms of stress you have experienced in the last month. 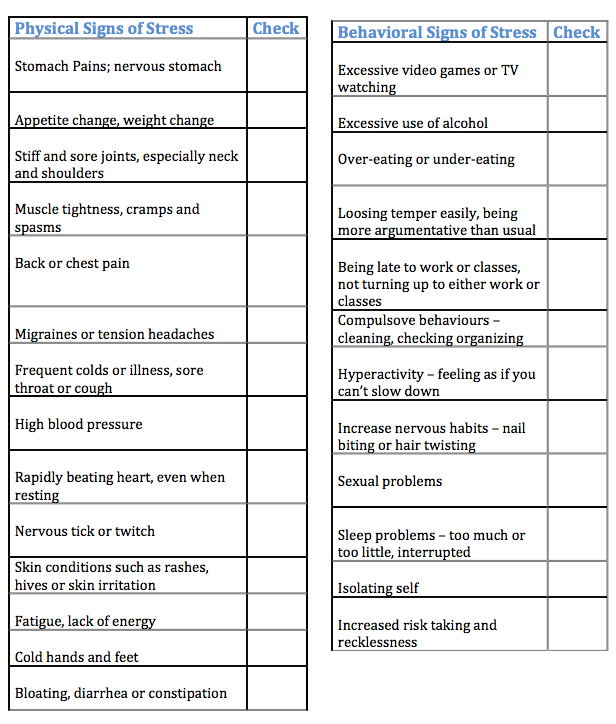 Please note that this is not an exhaustive list and that some symptoms are also signs of other underlying health issues. This checklist should be used as a tool only, and not be relied on as medical advise. While Bodyworkz deal mainly with stress in the workplace via on-site chair massage as the tool to implement a simple solution, we understand that this is only one way of dealing with stress. If you need advice and if you're not coping, please seek help. Remember to always consult your Doctor or health professional before self diagnosing. This checklist is adapted from “Friends Helping Friends Handbook’ by the Bacchus Network. However if you are interested in finding out more about using on-site chair massage as a simple solution for stress management in the workplace, our therapists are trained specifically in the Bodyworkz Performance Technique™. Our 15-min-massage sessions helps increase the productivity and performance of your team, while keeping them alert at the same time. It’s always the same experience – it’s always fast, it’s always effective. Consistency creates comfort. When employees are thriving, business thrives as well.